Yesterday at the Basilica of St. Michael the Archangel in Pensacola, FL we held a ceremony that consisted of Exposition/Adoration, confession, a meditation, both recited and sung chaplets and Benediction. We had four priests available for confession throughout the time and it seemed like we had a lot of people attending. This was a city wide celebration for all who wanted to, to attend. After confession Cindy and I just spent some quiet time with our Lord in the Blessed Sacrament on the Altar. I was told by one of the priests that we can always use the word mercy in place of love because they have such a close meaning. It made for a nice meditation about how God’s love is so great and how infinite His mercy is. So, peace be to you during this Easter season. This is my favorite image of the Divine Mercy. I especially like the line at the bottom, “Jesus I trust in you.” How simple that is to say and how difficult it is sometimes to really feel that trust. Tomorrow is Divine Mercy Sunday again. If you need to know how to say the Chaplet or Novena you can find links to them in this post. Let’s all pray for our Lord’s continuing mercy. I think we need it very much in our country right now. 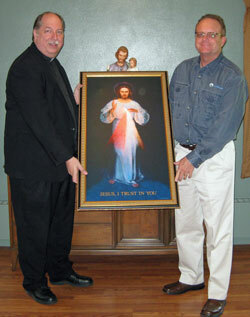 Today I had the pleasure of delivering an image of the Divine Mercy to our parish office. Pictured with me is our Pastor, Rev. Msgr. Robert A. Kurwicki. He blessed the image right away. We found a temporary home for it in the office area until they can decide on where to place it permanently. On Divine Mercy Sunday my wife and I participated in our service and that’s when we found out that we didn’t have one available in the Cathedral Parish except for one in the school. So we ordered one right away from Divine Mercy Images. It is beautiful and I would recommend them if you’d like a nice image for your church or home.